Dog Jersey Material: High quality breathable poly-mesh and satin for maximum comfort, durability and style. 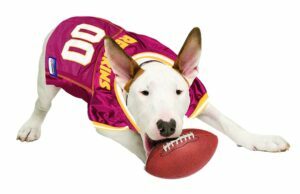 Dog Jersey Uses: Dress up your dog for hosting a party, watching a game or give as a gift! Dog Jersey Stats: Officially licensed, woven NFL shield and jock tag, screen printed TEAM NAME, LOGO and NUMBERS! Dog Jersey Sizing: Measure your Dog from the nape of the neck to the tail. Click link below for size chart.